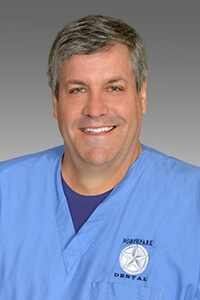 Dr. Thomas Gibbons is a 1986 graduate of Baylor College of Dentistry. Born in Chicago, he came to Dallas after a brief stop in Little Rock, Arkansas. He graduated from Richardson High School and finally from Texas A&M in 1999. Yes, you did read that right. He graduated from dental school in 1986 and college in 1999. Backwards? Yes – and a good story, too. Ask him about it sometime. He has been a Fellow in the Academy of General Dentistry since 2000 and earned his Mastership in the Academy in 2015. He has spent numerous hours continuing his education in various disciplines of dentistry. Many of his continuing education courses have been with respected leaders in dental education, including the Pankey Institute and Dawson Center for Advanced Dental Study. Most of his efforts are in reconstructive dentistry and, more recently, implant dentistry. Dr. Gibbons’s goal is to get to know his patients and help them make good, informed choices in their dental health. Dr. Gibbons has been married since 1989 to Dr. Julie Neubach. They have three children.